Sweden hold a slender advantage after the first leg of their Euro 2016 play-off tie against rivals Denmark. Emil Forsberg swept the ball home with a crisp finish in the first half before he was fouled for a penalty converted by skipper Zlatan Ibrahimovic - his first goal against Denmark. But the Danes pulled a precious goal back when Nicolai Jorgensen stabbed the ball home at the far post. It leaves the return leg in Copenhagen on 17 November delicately poised. Tuesday's match will be the 105th meeting between the Scandinavian rivals and it could yet be the last game in charge for Denmark coach Morten Olsen. He won 102 caps as a player and has coached Denmark since 2000, reaching four major finals, but announced earlier in the year that the Euro 2016 campaign will be his last. 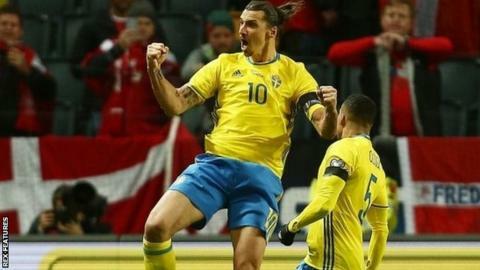 It was looking particularly dire for him at one point but his team rallied after pulling a goal back and it was Sweden who were hanging on at the end. Read a guide to all of the play-off games here. The match, played at the Friends Arena in Solna, started slowly but Leicester keeper Kasper Schmeichel made a brilliant save to deny Marcus Berg midway through the opening half after the Panathinaikos striker connected with a Oscar Lewicki cross. Berg should really have put the home side in front just after the half-hour mark after Ibrahimovic played him through but the striker dragged his shot across goal and wide. Nicklas Bendtner might have punished the Swedes' profligacy but could not find the target after Christian Eriksen's through ball put him in a brilliant position. That was as good as it got in the opening half for Denmark, with Forsberg superbly connecting with Mikael Lustig's pull-back for the opener. And after Schmeichel rescued his team once again with a save from an Ibrahimovic free-kick on the stroke of half-time, the keeper was powerless to stop the striker's penalty after Thomas Kahlenberg tripped Forsberg. Ibrahimovic - this week named his country's footballer of the year for the 10th time - had the ball in the net again but that effort was ruled out for offside. And after failing to score a third goal, Sweden were punished for switching off at a corner, Jorgensen converting a flick-on from Yussuf Poulsen. Match ends, Sweden 2, Denmark 1. Second Half ends, Sweden 2, Denmark 1. William Kvist (Denmark) wins a free kick in the defensive half. Attempt missed. Nicolai Jørgensen (Denmark) header from the centre of the box is high and wide to the right. Assisted by Lars Jacobsen with a cross. Hand ball by Marcus Berg (Sweden). Substitution, Sweden. John Guidetti replaces Zlatan Ibrahimovic. Goal! Sweden 2, Denmark 1. Nicolai Jørgensen (Denmark) right footed shot from the left side of the six yard box to the bottom left corner. Assisted by Yussuf Poulsen following a corner. Attempt missed. Yussuf Poulsen (Denmark) header from the centre of the box misses to the left. Assisted by Christian Eriksen with a cross following a corner. Corner, Denmark. Conceded by Emil Forsberg. Attempt missed. Yussuf Poulsen (Denmark) header from the centre of the box misses to the right. Assisted by Riza Durmisi with a cross. Riza Durmisi (Denmark) wins a free kick on the left wing. Substitution, Denmark. Yussuf Poulsen replaces Martin Braithwaite. Corner, Sweden. Conceded by Lars Jacobsen. Offside, Denmark. Pierre-Emile Højbjerg tries a through ball, but Nicklas Bendtner is caught offside. Substitution, Sweden. Sebastian Larsson replaces Jimmy Durmaz. Attempt missed. Nicklas Bendtner (Denmark) header from the centre of the box is close, but misses to the right. Assisted by Christian Eriksen with a cross following a corner. Corner, Denmark. Conceded by Andreas Isaksson. Nicolai Jørgensen (Denmark) wins a free kick in the defensive half. Attempt blocked. Lars Jacobsen (Denmark) right footed shot from the right side of the box is blocked. Assisted by Christian Eriksen. Offside, Sweden. Marcus Berg tries a through ball, but Zlatan Ibrahimovic is caught offside. Substitution, Denmark. Pierre-Emile Højbjerg replaces Viktor Fischer. Substitution, Denmark. Nicolai Jørgensen replaces Thomas Kahlenberg. Thomas Kahlenberg (Denmark) wins a free kick in the defensive half. Attempt missed. Jimmy Durmaz (Sweden) left footed shot from outside the box is close, but misses the top left corner. Assisted by Marcus Berg. Goal! Sweden 2, Denmark 0. Zlatan Ibrahimovic (Sweden) converts the penalty with a right footed shot to the bottom left corner. Penalty conceded by Thomas Kahlenberg (Denmark) after a foul in the penalty area. Penalty Sweden. Emil Forsberg draws a foul in the penalty area.